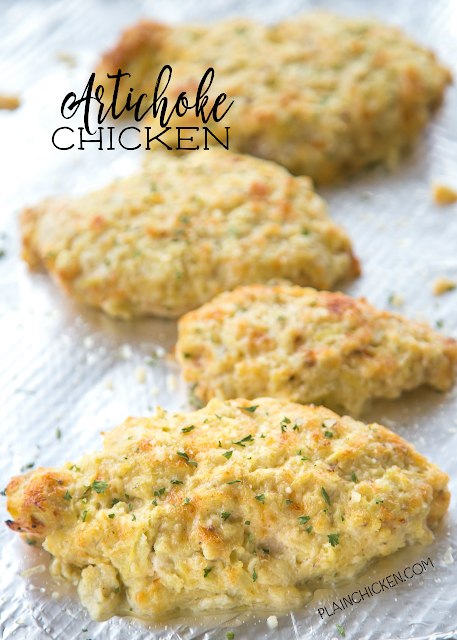 Artichoke Chicken - OMG! Better than any restaurant and ready in under 30 minutes!!! Chicken marinated in italian dressing, topped with cheesy artichoke dip and baked. Only 6 ingredients - Chicken, Italian dressing, artichokes, mayonnaise, garlic, parmesan cheese. Can assemble chicken earlier in the day and bake when ready. Everyone LOVED this!!! 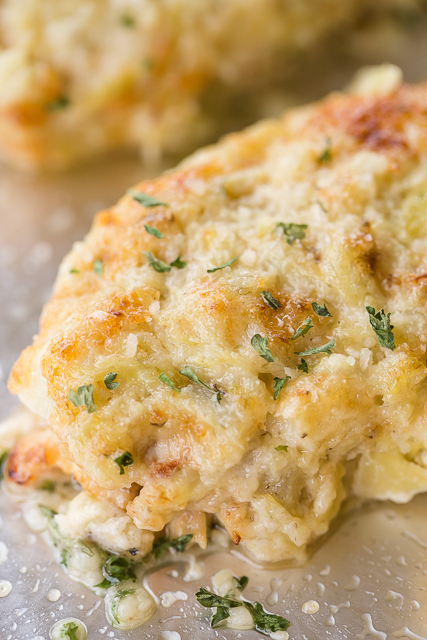 This Artichoke Chicken has quickly become a favorite in our house. It is incredibly delicious! This only takes a few minutes to make and it tastes fantastic. We've made this several time and even served it at a little dinner party. I love making this for a dinner party because you can assemble the chicken earlier in the day and pop it in the oven about 20 minutes before you are ready to eat. SO easy!! To give the chicken extra flavor, I marinated it in some bottled Italian dressing. I really think this made the dish. Nobody wants to eat bland chicken! The cheesy artichoke mixture on top is basically my favorite artichoke dip. OMG! I mean, how could anyone NOT like this?!?! Serve this with some asparagus, pasta or rice for a restaurant quality meal at home! Marinate chicken breasts in Italian dressing a few hours to overnight. Heat olive oil in non-stick skillet over medium-high heat. Remove chicken from marinade and cook 2 minutes per side. Place chicken on foil lined baking sheet. In a medium bowl, mix together chopped artichoke hearts, Parmesan cheese, mayonnaise, and garlic powder. Spread artichoke mixture evenly on top of chicken. Bake for 20 to 25 minutes, until juices run clear. Thank you for posting this recipe - we had it last night! It was delicious! "Spread artichoke mixture evenly onto of chicken." Does this mean onto the TOP of the chicken? As a single woman working full time, I often make something on the weekend that I have for dinner all week. I doubled the recipe for this last weekend, so I would have enough to enjoy all week, and I'm _loving_ it. I've enjoyed quite a few of your recipes since coming across this site, but I think this may be my favorite yet! I like making some brown rice to go with it. Made it tonight and added sliced mushroom. Heavenly!!!! Wow, thanks for the idea. I just happened to have a bag of mushrooms with no specific purpose! Do you use marinated artichoke hearts? No. I used plain canned. You can use marinated artichokes if you prefer. Enjoy! I was wondering the same thing! Did you try it? I’m think chicken thighs instead breasts. More flavor and moisture. What do you think? Sounds good! You may need to adjust the cooking time. Made this tonight. I added breadcrumbs. It turned out amazing. I will definitely be making this again! Thanks for sharing.